In a typical remodel, the home dictates the makeover. In this case, the makeover dictated the home. Vincent and Lorrain helped the San Francisco–based couple search for the perfect home to remodel. After touring about ten properties, they found a large house on a parcel with sprawling views of Boca Reservoir in Truckee’s Juniper Hills neighborhood. Vincent called the home “incredibly vanilla,” but it had good bones. Vincent and her team at High Camp Home spent about four months assembling a design including everything from interior architecture to material choices and furnishings. “As soon as that was approved, Bill’s company got started,” she says. 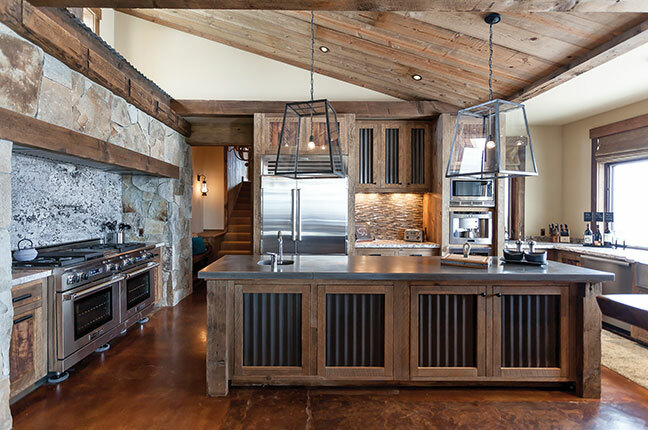 The white drywall and mishmashed angles and beams of the original transformed into a wood, steel and stone estate. Stepping through the front door, an entryway of two opposing stone seating areas replaced the original closets. 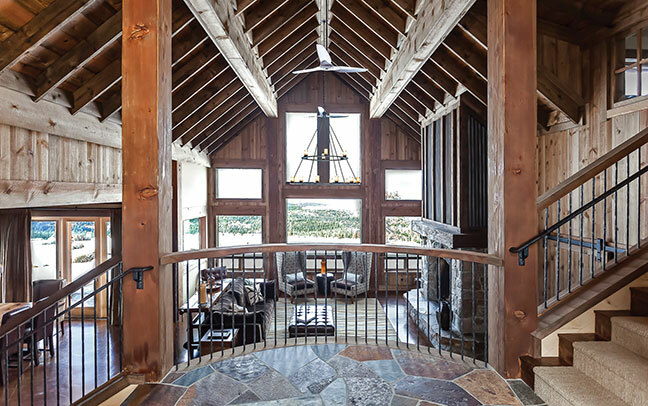 A Juliet balcony overlooks the great room, where a sliding barn door can close off the entrance to the home’s guest wing, bringing symmetry to both sides of the large fireplace. Vincent replaced and reframed the arched windows with more traditional lines. The kitchen features a large island and smaller peninsula that divides it from the dining area, as well as a restained concrete floor. Making the large home intimate proved a challenge. “It was so sterile,” Vincent says. She and her team combated the problem by designing smaller, cozier spaces. Walls built in the family wing created an office and established a hallway. In the master suite, another wall was added to craft a new entrance. Replacing a bizarre walk-through closet with a fireplace and adding a kitchenette further enhanced the layout. 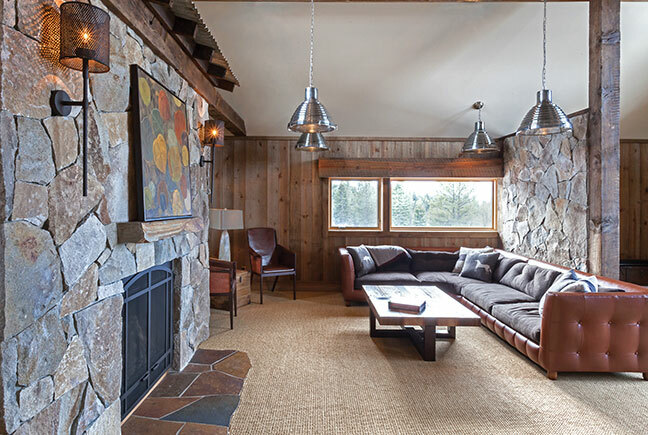 Truckee’s Johansen Masonry installed the stonework using a “Farmhouse Creamery” blend of stones, which is a little lighter and more contemporary than the typical dark granite. Vincent used sheet metal to adorn the decorative interior roofs, such as in the media room. 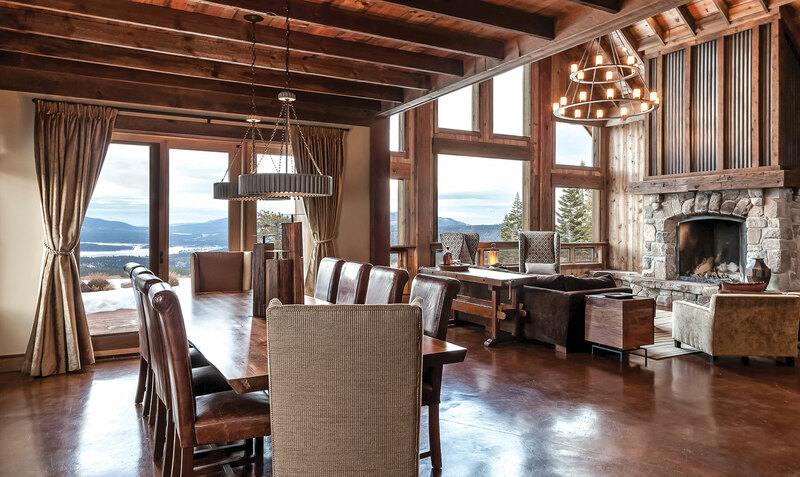 Lorrain’s company sourced the woodwork, from either dead standing timber it mills in Truckee or reclaimed barnwood from northeastern California. In July 2013, the “vanilla” spec house completed its transformation into one of High Camp’s signature looks. “This was a great house and a great project,” says Vincent.